The prevarication in the title is the acknowledgment that although sequentially from 12-month to six-months to three-month PPI inflation is accelerating in the EMU, the move more-simply watched in terms of its year-on-on-year pace is locked in a minor downtrend after having spurted. This sort of dissonance with price trends is not unusual especially not for the PPI where oil prices can play such a great role in affecting the price index. In any event, inflation is by definition a creature of the habitat over which it is measured. From 2010 through 2016, the PPI inflation rate decelerated and for four of those years ran at a negative pace. However, within 2016 the PPI made a turn and by end-2016 PPI prices were starting to show annual rate gains again. From a very depressed base, which weak oil prices had forced upon PPI price indexes, inflation rose in 2017. It peaked early in the year then it began to decelerate again. However, oil prices that have been rising late in 2017 and in early-2018 are beginning to affect PPI prices again, pushing them back up. In our rag-tag group of early inflation reporters dominated by EMU members but including some EU members and one EMU-don't-wanna-be-a-member-anymore, Germany ranks as the country with the fifth highest month-to-month PPI price rise in December. However, over three months, Germany once again has the lowest rate of inflation of the whole lot with a pace at 2.8%. Denmark ranks as second lowest; Italy ranks as third lowest. Three-month inflation is the highest in the U.K., Sweden and Ireland. Every country in the table has a higher three-month pace for inflation than a 12-month pace. In fact, only Austria and Denmark fail to show a consistent acceleration from 12-month to six-month to three-month. Germany also has the second lowest year-on-year PPI gain at 0.8%; Ireland's gain is smaller at 0.2%; Italy has a gain of 0.9%. Of course, Ireland does not have a grip on low inflation as it also has inflation at a very elevated pace over three months. 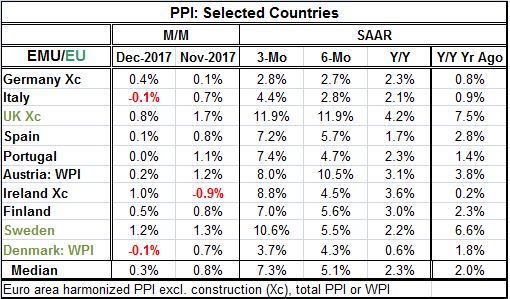 Among this grouping of countries, the median PPI rate of inflation over 12 months is 2%. Inflation, while zipping on ahead over three months, still has not escalated that much over 12 months. The U.K. leads the pack at 7.5% followed by Sweden at 6.6% then Austria with a WPI of 3.8%. After Austria, inflation is at 2.8% or less everywhere else. Energy prices are doing what energy prices normally do to inflation- they are raising it. With growth picking up, the monetary authorities might be a bit more sensitized to inflation moving higher. But the PPI is not the monetary authorities' index of choice, that would be the HICP and that is still very well contained. Still, it is quite a while since we have had both dependable-to-strong growth and some stirring of inflation at the same time. Central banks don't know what to make of it. Markets do as stocks are strong. The bond market, while backing up cautiously, is still trying to assess where it needs to be as participants are frenetically handicapping the activities of central bankers.